World 4 (known as Chapter 4 in Yume Kōjō: Doki Doki Panic) is the fourth world in Super Mario Bros. 2. The world has a unique snow and ice theme to it, and introduces the player to the Flurry and Autobomb enemies. The boss of this world is Fryguy, who is an intentionally out-of-place boss for this world, being a fire creature in an ice-covered world. The first part of the level consists of dodging Flurries while sliding on icy surfaces and jumping over pits. At the far right there is a plant that turns into a Rocket when pulled up, which takes the player to the next part of the level. Level 4-1 is notable for being the only level in the entire game without a boss, instead it has a long area filled with many enemies, with the boss music playing in the background. The Crystal Ball is lying unguarded on the ground at the end making this the only level in the game to not have a required boss fight to clear the level. World 4-2 is the only level in the game that has whales in it. The level starts underground, and has a vine that the player needs to climb to the first main part of the level. The player then needs to slide, duck, and jump along the ice while dodging a flock of Beezos. After going through a doorway, the next section has the whales in it. 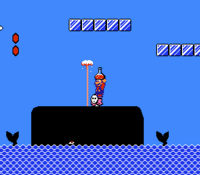 The water coming through the blowholes can hurt the player if the player hits it from the sides, but the player can stand on top of it. The final section has a large spike pit, which requires the player to dismount Shyguy from the Autobomb and ride on it to safely cross over the spike pit. 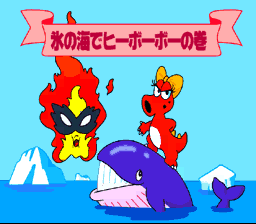 Then, the player gets to face Birdo before advancing on to World 4-3. This level also has a hidden warp to World 6. After the player enters the area with the whales, they should look for a Magical Potion and drop it near a jar. Upon entering the jar in Subspace, the player will warp to World 6. In world 4-3, Pink Birdo is strangely seen as a seemingly normal enemy early in level, and reappears after being defeated whenever the player reenters the room it is in. This allows it to be defeated an infinite number of times for a massive amount of points. The actual purpose of this out-of-place Birdo is for the player to ride on one of its eggs across the otherwise impassable ocean to reach the main dungeon where Fryguy's lair is located. This page was last edited on March 22, 2019, at 22:43.